One of the things that had always struck me about documentaries of World War I is that the soldiers fighting it always seemed to be having a grand old time. This is all the more astonishing given that that war was ghastly fought in rat-filled trenches and in No Man’s Land battlefields with advancing troops methodically mowed down by machine guns while crossing barbed wire and overcoming the effects of mustard gas. Such a suicide march was derived from the combat rules of an earlier century that waged battle in open field and was massively sacrificial. By contrast, World War II may also have been awful but at least there was an attempt at defensive self-preservation and not ludicrously throwing yourself in the face of the enemy. Yet, in Peter Jackson’s (the Lord of the Rings and the Hobbit trilogies) new documentary, They Shall Not Grow Old (at Windsor’s Silver City and The Maple Theater in suburban Detroit), we again hear numerous British soldiers eagerly describing the excitement of heading off to battle. It ‘saved us from rather boring jobs at home” says one, in interviews recorded decades ago by Britain’s Imperial War Museums. “I was dead scared the war would be over before I got to it,” says another. Dozens of optimistic, spirited and patriotic voices make up the audio of this extraordinary documentary. Jackson, a special affects wizard and extreme World War I buff (he even has his own collection of artillery), was no doubt the person to choose to make a film about this 100-year-old conflict that was a war (yes, “The war to end all wars”) like no other. His team took 100 hours of original film shot during the period – much of it, with time, under or overexposed – and remastered to bring up vivid images. And then, perish the thought but it works here, they colorized most of what you see (and viewed in 3-D). The team also had to integrate film speeds and correct often warped or jittery images. Colorization makes the images more real than the original footage. At the same time the experience is like watching a new drama. Jackson, in a fascinating documentary within the documentary after the film’s end credits about how this film was made, justifies the use of color by saying those WWI soldiers “were living their experiences in color” not black and white. The production crew jiggles a few other technical elements as well, including some presumed dialogue – but using official sources – of soldiers talking; the crew used lip readers. Jackson’s reason for making the film? Other than he’s a World War I nerd, he says most families have grandparents or great grandparents who were in the war, and that 100 years is not such a long time ago. He hopes the film will lead people to “do a little bit of research” into their own relatives’ involvement. ”The humanity of it is in how our own families were shaped by this war,” he says. Pawel Pawlikowski’s Cold War (at The Maple Theater and WIFF’s monthly film screening Feb. 24), a nominee for Oscar best foreign language film, seems almost refreshing in two ways. First, it’s in black and white and in 1:33 screen ratio (squarish). And second, it’s a chronologically told story. So many films these days jump disjointedly from one period or scene to the next; they’re convoluted and not always easy to follow. I also, of course, loved that this picture is Eastern European, with that same Eastern sensibility that imbues so many of this region’s films, literature and art – a deep and dark almost poetic way of seeing the world. The film’s story is about a musical director Wiktor Warski (played by Tomasz Kot) and one of his discoveries, Zula (Joanna Kulig). The pair quickly fall in love. The film begins in 1949 in the obliterated cities of post-war Poland and during the post-Nazi rise of Communism. Zula is an exquisite folk singer with that “special something” that catches Wiktor's eyes and ears. But as Communism rears its totalitarian head, musicians are told they must inject more than a little social realism into their performances. After all, singing about “land reform” is just as romantic to the body politic as love, is it not? And stage backdrops of Stalin and Lenin are the cat’s meow to the associated masses. These state-ordered demands get on our musical couple’s nerves but only one, Wiktor, has the gumption or energy to escape, which he does by easily walking (this before the Berlin Wall was built) from East to West Berlin while the performers are in the German city. Years go by and he ends up a jazz musician in Paris. Zula finally rendezvous but she’s now committed to someone else. Their romantic flame hasn’t been doused, however. Wiktor returns to Poland and is arrested and sentenced to hard labor. There’s more to the story than this and love wins out in, shall we say, a melancholy (but very Eastern European) way. Great performances on both Kot and Kulig’s parts and kudos to Pawlikowski for his straight forward narrative. It’s possible Cold War could win this year’s best foreign flic at the Oscars, given the Academy may want to give a refreshing nod to a different part of the world, with Mexico’s Roma (Alfonso Cuarón) likely sweeping most other award categories. Harrowing. That about sums up four of the five live action short films (at the Detroit Film Theatre) in competition for this month’s Oscar. Whether most of the nominees should be sit on the edge of your seat dramatic films is another question. But all are emotionally taut and finely made. All, interestingly, involve children…..The first, from Spain, is Rodrigo Sorogoye’s Madre. The film opens with a sweeping view of an uninhabited beach. A mother (Marta Nieto) receives a call from her son, apparently abandoned by her estranged husband on a beach somewhere in northern Spain or France. The six-year-old doesn’t know where he is and cannot see land marks. The terrorized mother doesn’t know what to do, while her son’s cell phone battery drains and a stranger begins stalking him. The film benefits from exceptional acting and elongated visuals within the mom’s apartment…..Next is Fauve by Canada/Quebec’s Jérémy Comte, which I had seen previously and was as stirring then as it was a second time. Two boys Tyler (Félix Grenier) and Benjamin (Alexandre Perrault) are horsing around in a rural area outside their town. They scramble under a fence to an abandoned open pit mine. At the bottom of the basin is quicksand. Benjamin gets trapped but extricates himself, but their adventures don’t end there. Amazing kid performances…..The third film is Marguerite (Marianne Farley), also from Quebec, and which is decidedly not harrowing. Instead, it’s a sweet nuanced story of a caregiver (Sandrine Bisson) and her elderly patient (Béatrice Picard). When Marguerite learns that her nurse is in a gay relationship it reminds her of an earlier episode in life when she was drawn romantically to another woman. Great poignant acting…..Back to harrowing. The fourth film is Detainment (Vincent Lambe, Ireland) , and the best of all five. It’s also the longest, and a re-creation of a sensational murder case in England in the 1990s. Two 10-year-old boys, engaged in shoplifting at the local mall, befriend a two-year-old. They take James Bulger for a walk, which ends in his murder. The film re-creates the police interrogation of the two boys, with astonishing performances by Ely Solan as Jon Venables and Leon Hughes as Robert Thompson. The youngsters, tried as adults, are the youngest convicted murderers in the UK in the 21st century…..Finally, there’s Skin (Guy Nattiv, USA) which follows a white trash family, the kind that for thrills hauls their kids around in couches pulled by a pick-up. Dad (Jonathan Tucker) trains his son (Jackson Robert Scott) to fire a rifle. Later, they’re at a grocery store. The boy locks eyes with a friendly African-American man, who shows him a toy. Dad, a racist, takes offence. He and his pals beat the black man to an inch of his life. But there’s more, in the vein of what goes around comes around. I understand there’s racism among small – very small – pockets of the population. But sometimes I think too much is made of it, adding to bad race relations. In fact, racism (at least the public overt type) seems so scare to me, my first inclination viewing the grocery scene was to think the white deadbeats would give a friendly nod to their fellow black customer. And now we move on to the 2019 Oscar nominated documentary shorts (at Detroit Film Theatre) which, like the last two year’s offerings, unfortunately, provide a general down note to the viewer experience. I continue to wonder if today’s filmmakers know how to make a documentary about anything other than politics or something with a “message.” So, okay, let’s go. First up is Black Sheep (UK, Ed Perkins), which actually is a poignant recreation of 30-something Cornelius Walker’s experience growing up in an England housing project. He was one of the few black kids in the Essex neighborhood and paid for it, being beaten up on his arrival. In order to fit in he joins the gang and ironically perpetuates the same kind of racist violence. “I felt guilty but I felt accepted,” he says looking back. Next film nominee is End Game (USA, Rob Epstein and Jeffrey Friedman), an intimate – some might think voyeuristically uncomfortable – look at several patients in a San Francisco hospice. One of the palliative care doctors, who himself had a near death experience, tries to ease the patients’ fears by using techniques such as to “make friends with death.” But even politics intrudes here, as the camera captures one patient, asked what day it is and who the president is, will not admit President Trump’s name and opts for “Obama.” A Night at the Garden (USA, Marshall Curry), the third entry, is the best of the bunch and stunning, and there’s nothing new or particularly creative about it. All it is, is a splicing of original newsreel film and soundtrack – which overwhelmingly speaks for itself - from 1939 when a giant rally was held at Madison Square Garden. 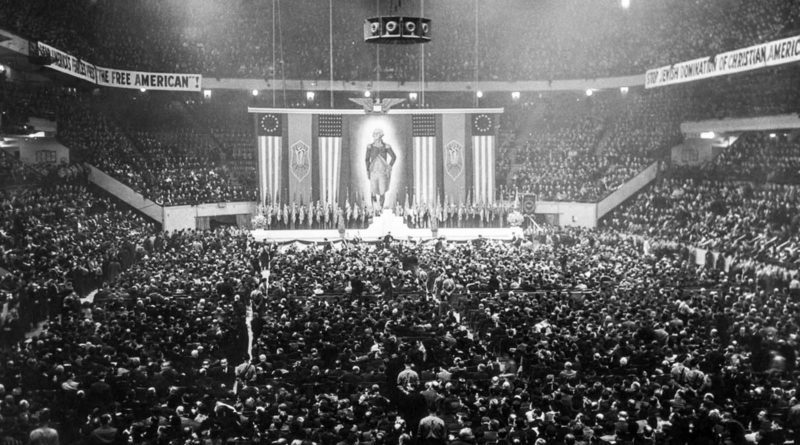 The American Nazi party drew thousands to a pro-USA event complete with Nazi salutes and the regurgitation of US constitutional principles like "liberty." There’s even a giant image of George Washington. The event is weird and awful in all the seven minutes depicted. Lifeboat (USA, Skye Fitzgerald), is another film (the short doc, 4.1 Miles, by Greek director Daphne Matziaraki was nominated in 2017 but didn’t win) about rescuing Africans trying to cross the Mediterranean in ramshackle vessels, and their rescue by non-profit groups, in this case Sea Watch. Searing photos of the destitute, though most seem able-bodied young men, are shown. And the now deceased rescue captain Jon Castle has some thoughtful words about refugees and survival, as in the closer you get to real people the less they're political abstractions - “you start thinking with your heart instead of your head.” Finally, Period. End of Sentence (USA, Rayka Zehtabchi) is set in a rural area of India not far from Delhi that seems lost in time, where men - and women - are exceedingly ignorant of sexuality and women’s menstrual cycles. “Menstruation is the biggest taboo in the country,” we’re told, with women often having to use dirty rags. A group of them are introduced to a machine that will make proper sanitary pads. Not only are these pads more absorbent than a few others on the market but the women become modest entrepreneurs going village to village selling them. Fascinating and eye-opening. Funny how the best film in the crop of Oscar nominated short animations (at the Detroit Film Theatre) this year didn’t even make the final five. It is Russia’s Tweet Tweet and got only one of two Highly Recommended mentions. Directed by Zhanna Bekmambetova the film packs an emotional punch as it follows the life of a girl in pre-war Russia through World War II, the Cold War and beyond as she grows into a young and then elderly woman. She walks a tightrope which becomes a barbed wire, all the while helped or even saved by a little sparrow “Tweet Tweet.” The next best film (part of the officially nominated five) was Canada’s Animal Behaviour (Alison Snowden and David Fine), where a group of animals sit in a group therapy session. Their therapist glasses-earing dog is trying to keep the neurotics focused. “Don’t be afraid, we don’t bite,” he says (chuckle chuckle). His patients include a leech with separation anxiety, a praying mantis who’s a single mom with “thousands” of kids, and an ape with anger management issues. You can’t help but LOL at all this even if the theme is a little predictable. Bao, another Canadian flic (Domee Shi) is a charming sketch of a Chinese-Canadian empty nester who one day prepares dumplings, only to have one hatch (okay!) as a baby. She lovingly takes it in but, over the years, has to again deal with the sometimes awkward stages of a child’s growth. Ho hum. Late Afternoon (Ireland, Louise Bagnall), is another short that focusses on family and longing. The elderly Emily daydreams about her life as a young girl and bringing up her daughter, Kate, now her caregiver. Tea and biscuits, and old family portraits, trigger deeply felt memories. Yet another Canadian-related film is Weekends (an American entry though made by Filipino-Canadian Trevor Jimenez) with edgy sometimes surreal graphics about a boy shuffled between his divorced parents. Confusion and even some poignant pain is depicted but I couldn’t figure out why the boy’s martial arts-loving dad always played the Dire Straits’ Money for Nothing. Hmm, maybe a metaphor. One Small Step (USA, Andrew Chesworth and Bobby Pontillas) is another whimsical tale (not that there's anything wrong with whimsy, only there’s a lot of it in animation) about a young girl fascinated with becoming an astronaut. An initial slow learner she blooms and graduates from the astrophysics academy, realizing her dream and wearing astronaut boots almost identical to the ones her deceased shoemaker dad made for her when she was a child. Like Late Afternoon and Bao, the flic has a heartwarming glow but doesn’t rise much above that. Finally, the other Highly Recommended short, like Tweet Tweet, is Lizzie Zhan’s Wishing Box (USA). A pirate discovers a chest of treasure but can’t seem to extricate any jewels. Yet his monkey sidekick has a grand time finding fruit and other goodies the captain could care less about. When a jewel is finally extracted, it leads to an avalanche of the precious gems, which in turn pile up and, uh, sink the ship. Moral of this story?